Giving newborn baby a name that he or she will be addressed as for life. It's never a skill to give names.. Giving nicknames to your schoolmates is one thing..giving names to entities whom shall depend on others to identify itself for its entire existence is totally different.. 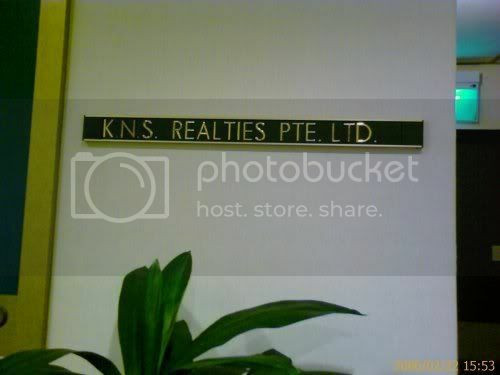 It may be naming a newborn baby... naming a new species or element... naming a new start-up company..
Been opening my eyes lately to interesting names... and below was a company name which i chanced upon when I went into a office building to collect some items from a guy whom works in the same floor. It was a kodak moment for me.. The reason the picture wasn't really sharp was because I was trying to stop shaking.. I'd rather let this picture do the explaining. "Sikit Sikit Lama Lama Jadi Bukit"
In simple english, it means that through little accumulations over long time, anything can become big. This applies very much to my learning of the Malay language as well. My work requires me to go into Malaysia very often and every single visit, I'd try to learn new words. I remember the early days of my working in Malaysia when I even had problems trying to tell a local taxi driver to go to the nearest food establishment in the local language.. Sad that even though my country's national language is Malay, and I can't even hold a simple conversation. Sikit is "a little bit"
Today is 7 October 2006. Riko Tachibana Retired from Acting.. So sad..